While diligent home care can take you a long way toward preserving excellent oral health, professional dental hygiene appointments remain necessary to keep your teeth and gums in optimal condition. Plaque hardens on your teeth in as little as 26 hours, and once it’s there, because it mineralizes, it is much harder to remove and requires the professional skills and tools of your dental hygienist. At Kingsway Dental Centre, our professional dental hygienists are both thorough and very gentle. Their training will help keep you on track to avoid such conditions as periodontal disease and dental caries (decay). We also look for conditions like oral cancer and cysts. Your professional dental cleaning is more than a quick polish. 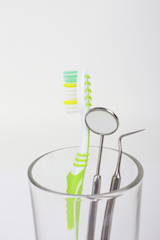 Often, your hygienist is the first to spot a problem with the health of your gums. They can help you address any areas where you have infection, bleeding, or significant build-up and support you in getting back on track. Your dental hygienist will perform a thorough exam of your gums and may take measurements of pocketing and recession in order to assess your periodontal health. Then, your hygienist will remove any plaque (calculus) buildup with specially designed instruments, making sure you are completely comfortable for the entire procedure. Has it been awhile since you had a professional cleaning? You may require a bit more time to get caught up. If it’s been a while, let us know when you make your appointment and we can schedule enough time to properly treat you. We have more extensive dental hygiene appointments available in order to address problems like periodontal disease. Dr. Jim Haymour, Dr. Everett Postill, and Dr. George Laschuk can determine the type of dental cleaning you require when they perform a dental exam at our Edmonton dental office. We base our treatment on your specific needs. In most cases, a professional cleaning every six months is appropriate to keep you healthy. In some cases, however, we may need more regular visits in order to restore your dental health and complete your treatment. If you fall into this category, we will be sure to discuss your options. When necessary, we will take dental x-rays at your hygiene appointment to use in diagnosis and treatment of any dental conditions. Dental x-rays determine bone levels, areas of decay, cysts, tumors, and abscesses. We take only the x-rays needed to accurately diagnose and treat any dental conditions. Has it been six months or more since your last professional dental cleaning? Call our office to schedule with one of our dental hygienists for your preventative professional dental cleaning. We look forward to giving you a super clean smile that makes you proud.